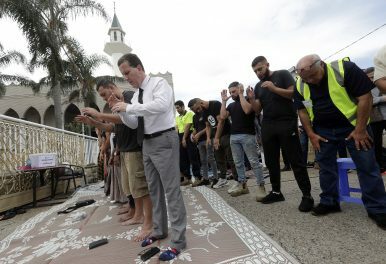 Men attend Friday prayers at Imam Ali bin Abi Taleb Mosque in Sydney, Australia, Friday, March 22, 2019. The sermon is dedicated to addressing the attacks where 50 people were killed at Christchurch, New Zealand. In 1998, four former Australian Prime Minister’s from both sides of politics became signatories in an open letter addressed to “all Australians” stating that “Racism is an unmitigated evil, it is immoral, it does Australia significant harm… it destroys our self-esteem and self-respect… there can be no place for racism in Australia.” Now more than ever, Australians have committed to bipartisan support in an effort to combat racism. Often in the frames of decision-making, politicians need to be pragmatic on many issues, by adjusting policy to incorporate different views and opinions. Racism, however, is contemptible and it is beyond compromise. The just commitment by politicians from all political parties recently to condemn racism in the form of Islamophobia has come following Senator Fraser Anning’s comments suggesting the recent terror attacks in Christchurch were a direct result of Muslim immigration to both Australia and New Zealand. Some will denounce Anning’s comments on March 15 for its hidden meaning, using the act of terror and tragedy as an opportunity to blame the victims. More prudent, however, would be to suggest that the Muslim community over the past two decades in Australia has often been framed as the perpetrator for violent extremism, but is now viewed as the victim. Anning had introduced his anti-Islamic stance to the Australian public before, with reference to a “final solution” required for Muslim immigration. However, taking Anning’s rhetoric at face value reflects the limited demand by the Australian public for a complete ban on Muslim immigration. Anning’s comments came out of the act of terror that was committed on the people of Christchurch on Friday March 15. A 28-year old Australian man entered the Al-Noor Mosque and the Linwood Islamic Center in Christchurch on March 15, his violent acts left 50 people dead and a further 50 injured. The underlying issue is that the attacker did not see the essence of life nor the innocence of the victims, but only saw a religion and a threat. The events sparked both horror and outrage, calling for international leaders to denounce Islamophobic violence. The response by Australian Prime Minister Scott Morrison demonstrated that a form of Islamophobia does exist within Australia. Not necessarily an avid animosity toward Islam, but more so the fact that Australians don’t tend to understand Islam very well, and that can lead to a fear of what we don’t understand, so by definition, Australia tends to have an Islamophobia epidemic. This fear is also important to mention, as once this racist attitude becomes a norm within a political culture, it can grow and spread in violent and deplorable ways. In Australia, this racist nature has existed for a long time in relation to indigenous peoples and toward Asians, more recently toward Muslims. But by considering the multiculturalism that exists in Australia, it is not surprising to share the view that any community can take itself to a point where they engage in any form of fundamentalism, produces a danger to innocence. The ultimate victim of which is peace. The statement itself was never seen as a one-off account of Anning’s instrument of policy. Concerns about the fear of the rise in anti-Islamic rhetoric should therefore be minimal. The fact is that Anning’s comments reside not in an Australian view of being anti-Islamic, but what is represented as a threat to Australian nationalism, not an expression of it. Multiculturalism’s growing influence in Australian identity continues to impress and is still increasing. And Anning’s rejection of the cultural reality that exists in Australia won’t change that fact. Racism is a latent poignant way to express an opinion, and for now, Islamophobia can be most useful as a latent challenge to Australian identity. As Gough Whitlam, Malcolm Fraser, Bob Hawke, and Paul Keating suggested over 20 years ago: Racism has no place in society and Australian politicians from all sides of politics are making full awareness of this fact. The great tragedy surrounding Senator Anning’s comments is that they have perpetrated a myth, a fantasy, and a lie. The myth of a monoculture, the tragedy of not acknowledging multiculturalism’s benefits to society, and ultimately a lie which we must condemn. Conor McLaughlin is an Australian Government Endeavour Scholarship Recipient as the Association of Foreign Affairs at Lund University, Sweden.